The Quechee Inn at Marshland Farm provides an exquisite backdrop for New England Wedding Photography. The Quechee Inn is one of the many beautiful wedding venues located in the state of Vermont. The inn’s setting near the Ottauquechee River, and the farm’s inclusion of historic red barns and lush green meadows, make for picturesque New England Wedding Photography. 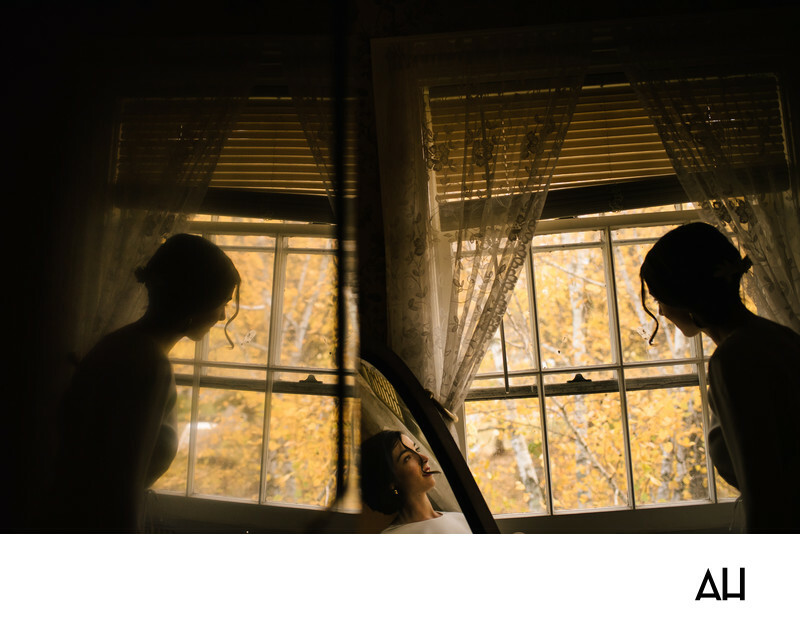 This photo from a wedding at the Quechee Inn shows the bride as she prepares for the events of the day in one of the inn’s cozy, yet elegant rooms. The bride’s dress is sleek and pure white, with a high collar and long sleeves. Her hair is pulled back in a graceful updo that clinches at the nape of her neck. In the image, the bride is leaning over a bit to look out the window as the guests begin to arrive outside. A rouge curl escapes from her updo and falls in front of her face as she gazes outside. The leaves on the trees seen through the window pane are autumn yellow, and they wave to the bride in the chilly fall air. Sheer lace curtains frame the window, adding to the timeless ambiance of the photograph. The most interesting aspect of this picture is that it is actually two pictures that have been combined. The bride’s image is reflected in two places, once in the mirror and then again in the second copy of the picture. The copy, on the left, is faded, as though this moment has already started to become a beautiful, faint memory of a truly special day.